Atomic Blocks would work perfectly for a wide range of different blog topics. It’s a very clean and simple theme with a very basic layout, lots of white space and great typography. If you used this theme for your blog, your media would look great and your blog would be easy to read and navigate. 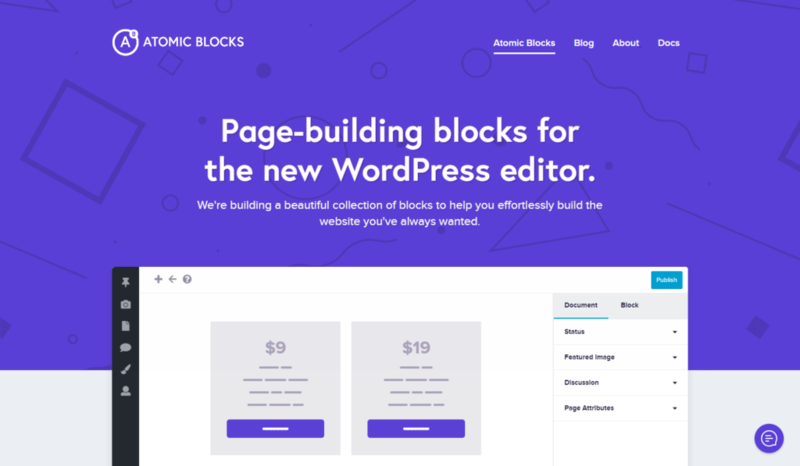 For most people starting out with a blog, this is really all you need and Atomic Blocks may be a perfect theme choice for you. 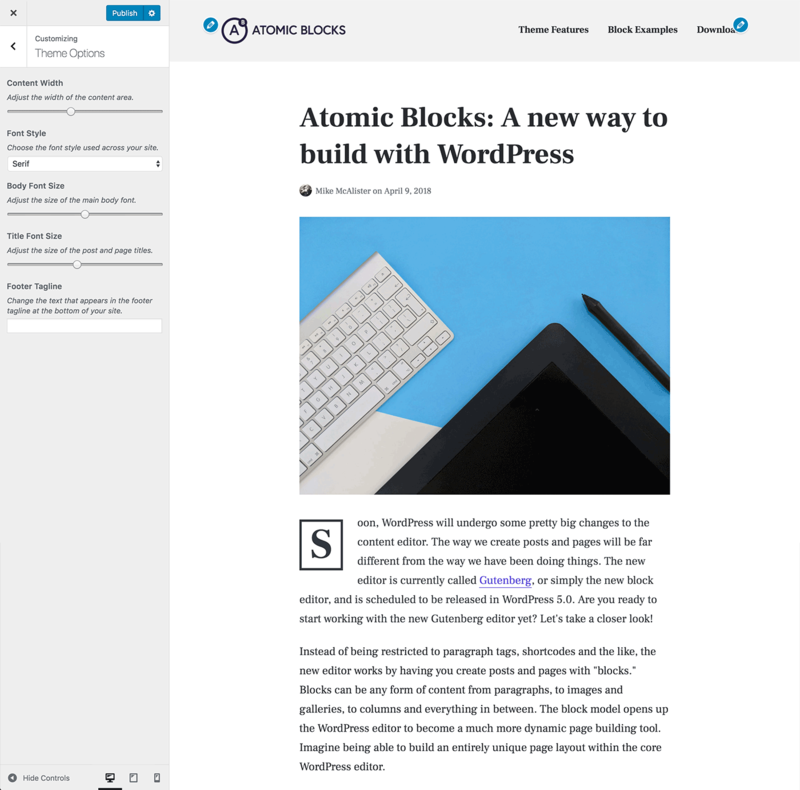 The Atomic Blocks theme provides you with a small number of tweaks that you can make from the WordPress Customizer. You can easily upload your own logo, change the content width, choose between a few different font styles, and change the footer. The great thing about the Atomic Blocks theme is that it has been built specifically to integrate with Gutenberg. If you’ve not heard much about Gutenberg yet, you soon will. WordPress is going to change soon by replacing it’s current editor with a new one called Gutenberg. It provides a completely different editing experience and will provide much more power to the user. We’ll be seeing many more Gutenberg compatible themes in the future but right now, Array Themes are one of the first to start paying attention to Gutenberg. Array Themes have gone as far as to create a whole new website dedicated to their Gutenberg blocks plugin. The website is called Atomic Blocks, just like the theme. This is where you can download specific blocks that will work with Gutenberg and add extra functionality to the new editor. Array’s free plugin will let you add testimonials, author profiles, accordions, sharing icons and much more. Atomic Blocks is a great theme and Array’s set of free Gutenberg blocks are great too. 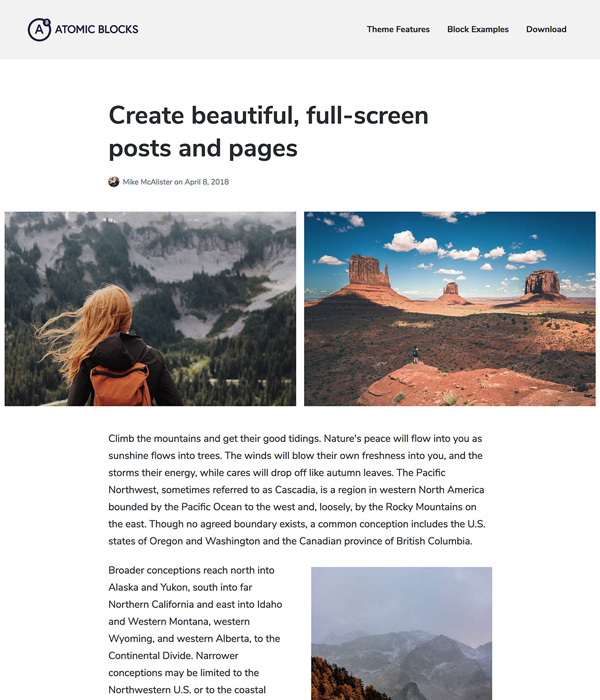 If you’re looking for a high quality blog theme and you’re concerned with Gutenberg compatibility, this theme will be perfect for you.